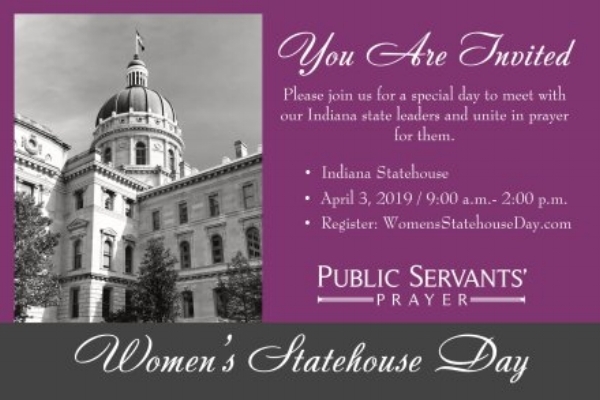 Women’s Statehouse Day is a very special annual event designed to bring Christian women to their capitol from all over the state of Indiana, to meet their legislators, hear from them, and pray for them. Our leaders need wisdom and discernment to tackle the problems that beset our nation and our state, and they need our encouragement and support. We believe prayer is the means by which God moves to bestow that wisdom on our leaders, and so, “For such a time as this” we gather to pray. The call to prayer is based on two significant scriptures, 1 Timothy 2:1-4, which says we are to make it a priority to pray and intercede for our leaders, and Jeremiah 9:17-24, in which God specifically calls women to pray in their capital city for their nation and its leaders. Women’s Statehouse Day has proven to be effective in recruiting more and more women to pray for their leaders, and the leaders state how encouraged they are by the prayers and support shown them as evidenced on that day. We would love for you to join the ranks of women that pray much for our elected leaders, and to be encouraged meeting women from all over the state with like hearts on one very special day to pray together.